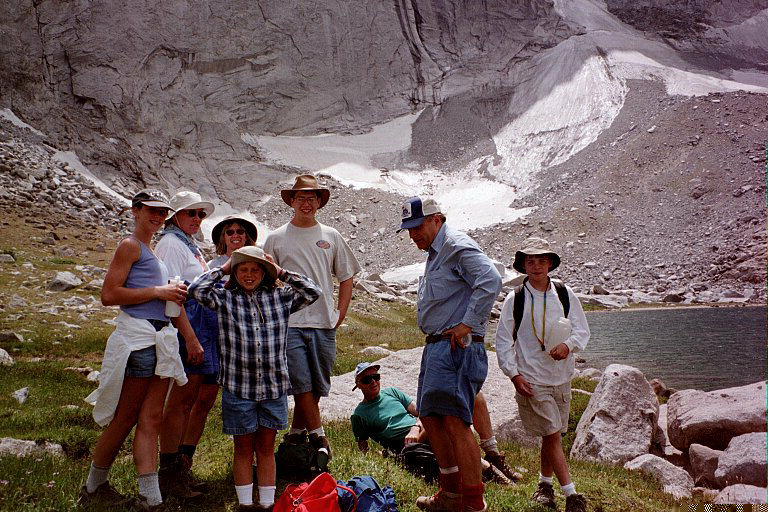 In August of 2000, Chemists again ventured to Wyoming's Wind River Mountains for fun and adventure. On Friday, Joel Harris, his son Peter, and Jack and Peg Simons drove to Big Piney, Wy. and spent the night in the Big Piney Motel. 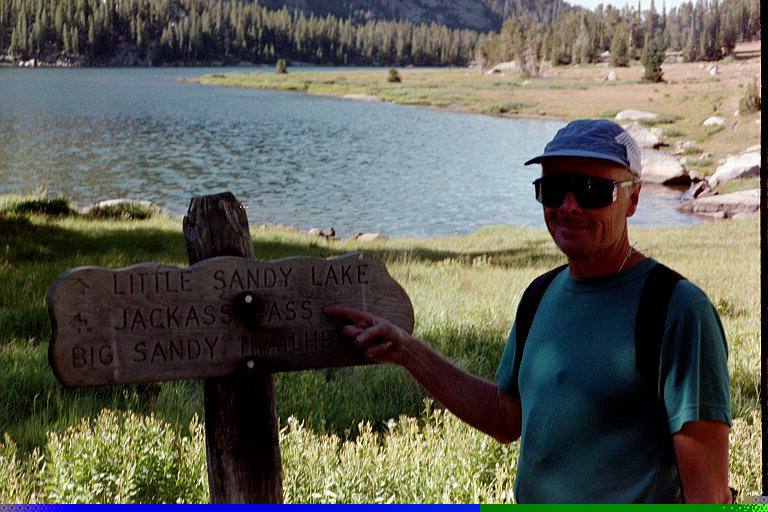 After a hearty breakfast at the Marbleton Inn the next morning, they drove to the Big Sandy Trailhead and began the 5 mile hike into Big Sandy Lake (below). 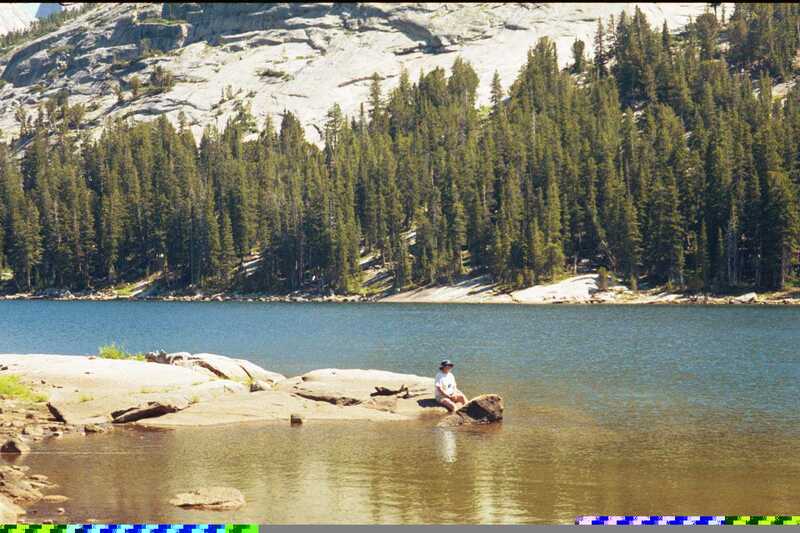 They began hiking at 10:00 am and first saw Big Sandy Lake a little after noon. 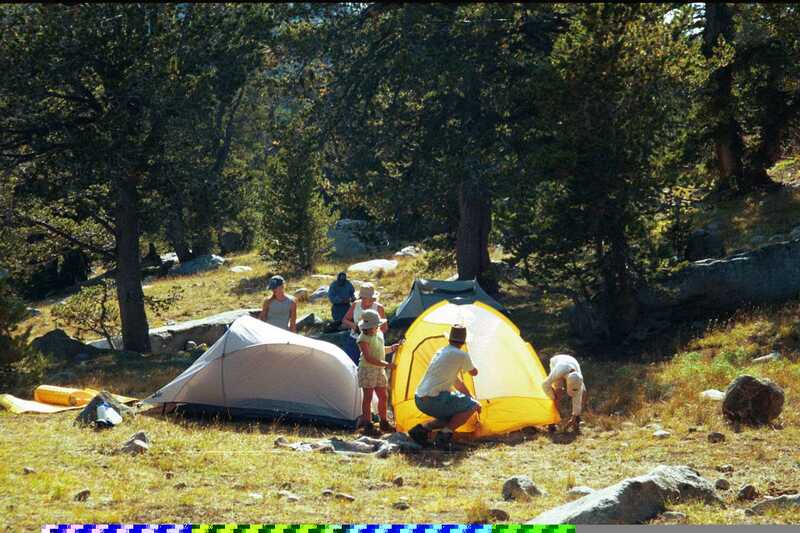 The remainder of the Chemists group, Tom Richmond, Chuck and LeAnn Wight, Mary Ann White (Armentrout), and Matt, Patty, and Erin Armentrout, left Salt Lake City early Saturday morning and drove directly to the Big Sandy Trailhead beginning their hike at about 1 pm. They also passed BS Lake after a couple of hours on the trail. 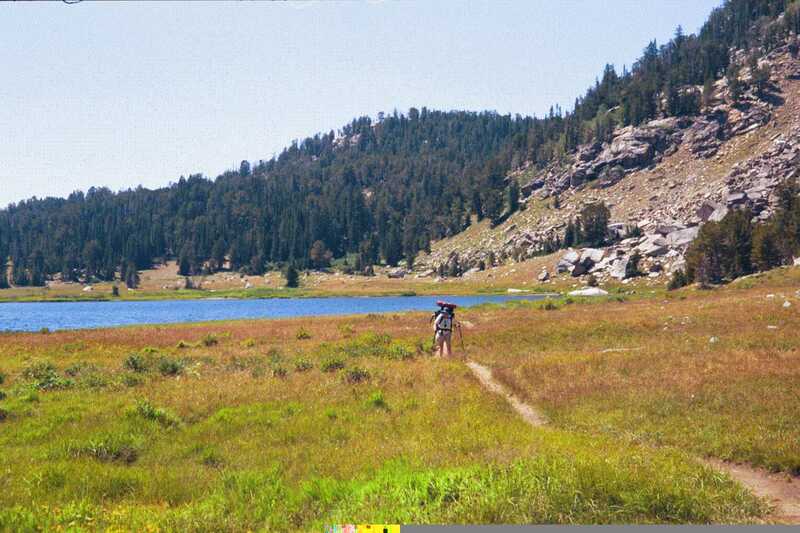 Below, we see Peg rounding the far side of BS lake on her way to the trail junction going to Clear Lake, our camp spot. 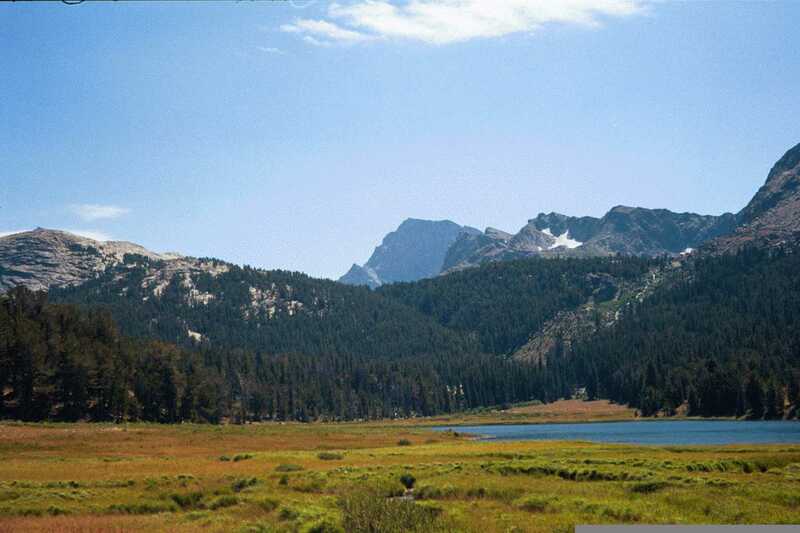 Below is the view looking back at BS lake toward the direction from which we came. 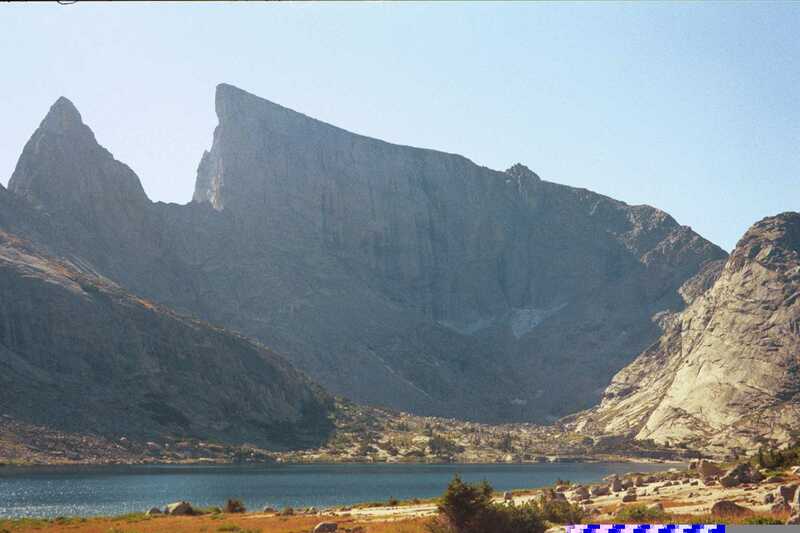 After about another hour of hiking past BS Lake, we came to Clear Lake (below) with the face of Haystack Mountain behind it (below). 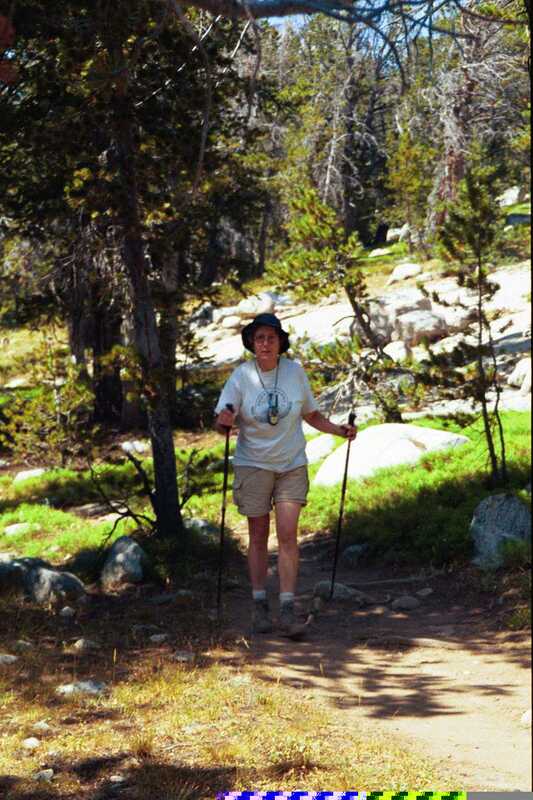 A little while later, Peg comes up the trail to Clear Lake (below). 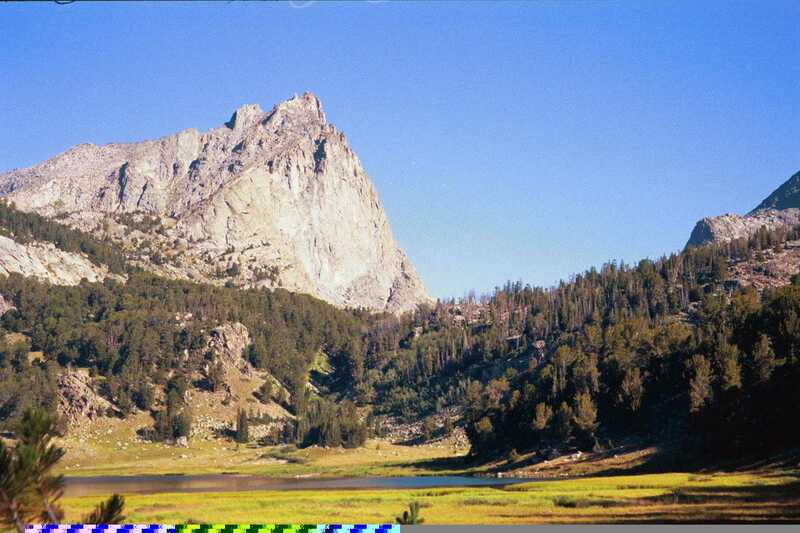 The camp site at Clear Lake has a fantastic view of Haystack (left) and of East Temple Peak (the sharp peak to the right). 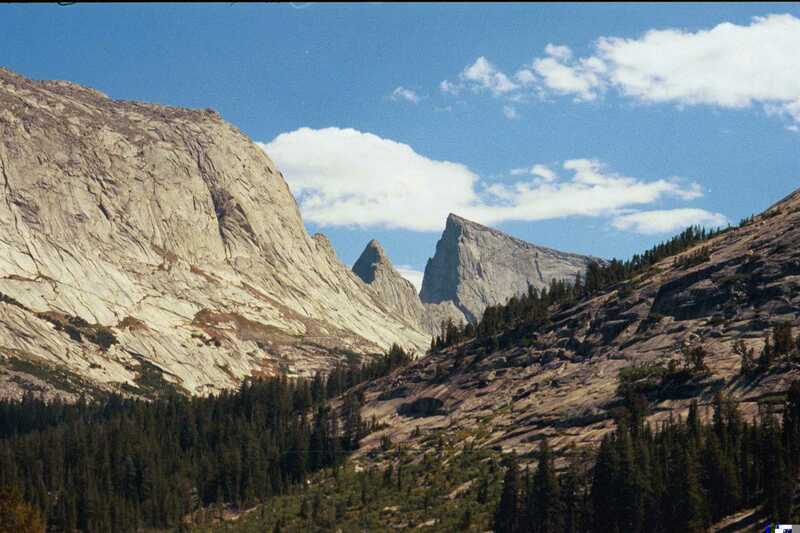 We got a more close up look at these peaks a day later when we hiked toward them (below). 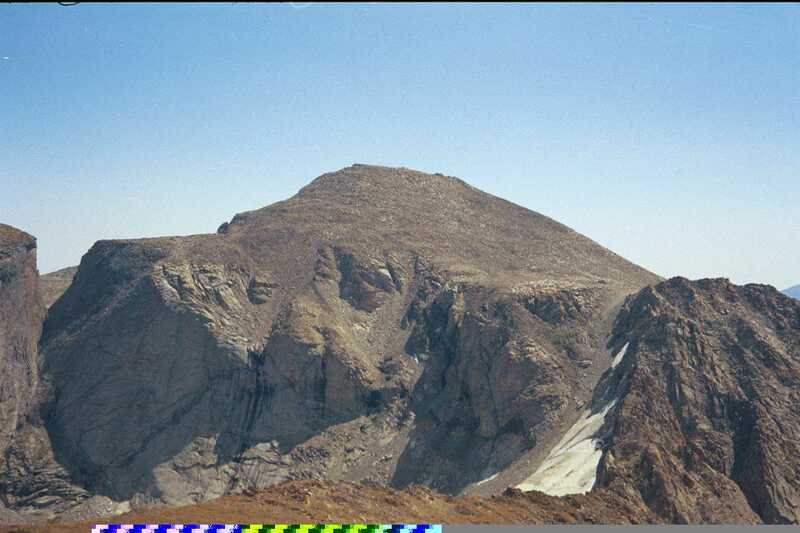 The sharp pointed peak at this center of this photo is where Tom and Jack got to the next day (more later). 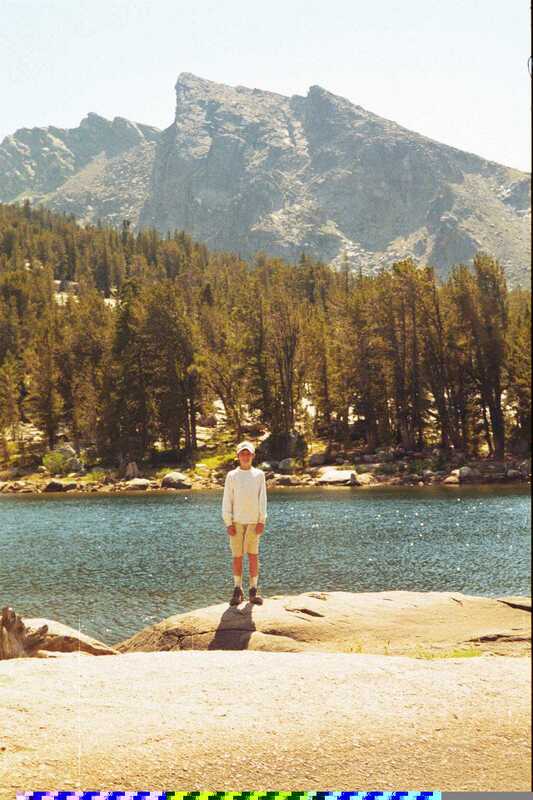 Peg was pretty tired, so she decided to put her feet into Clear Lk to cool off after reaching the camp site. 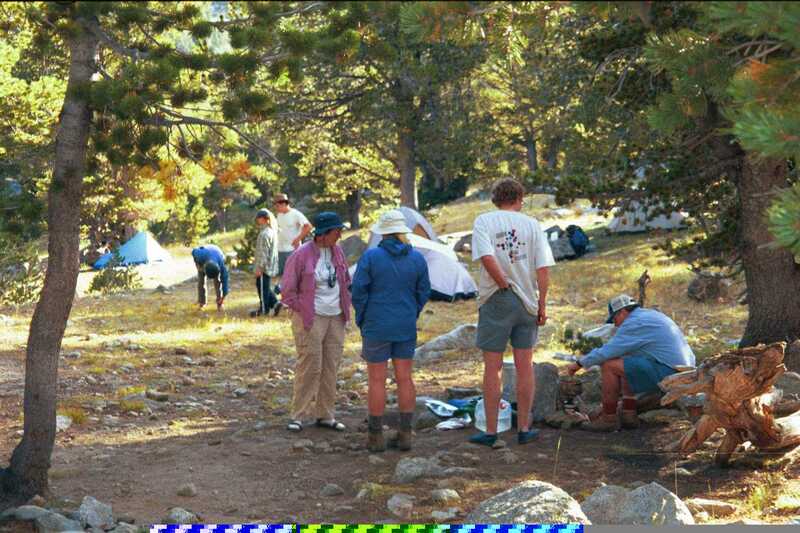 At about 4 pm, the remainder of the party arrived at camp. Below, we see Peter looking tough and fit. 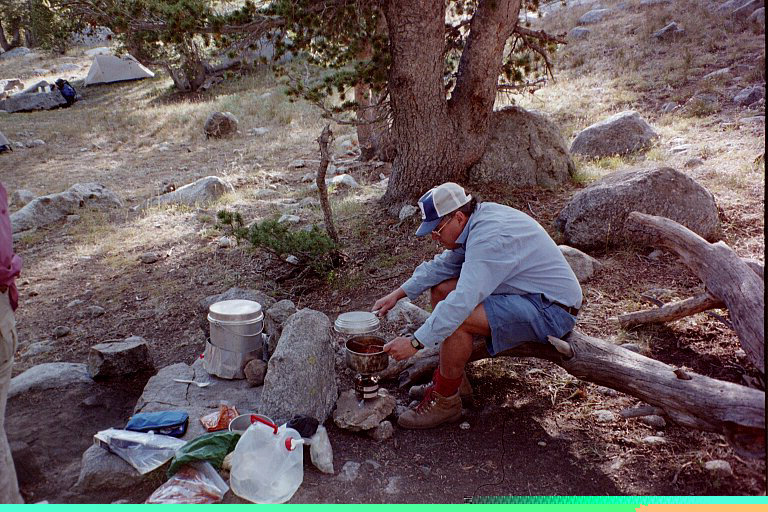 before brining out the cook stoves to begin preparations for a wonderful dinner (Tom's mother in law spaghetti- don't ask what Tom is doing). 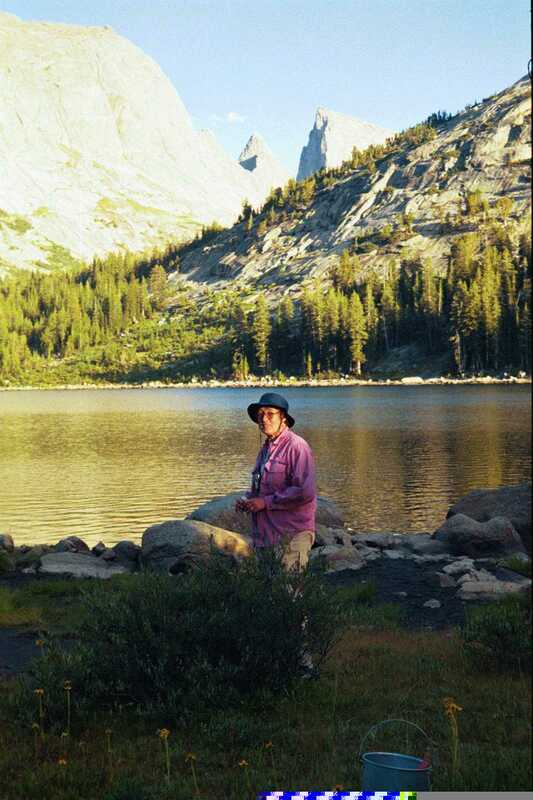 After dinner, Peg went down to the lake to wash the dishes and got a good view of the mts. 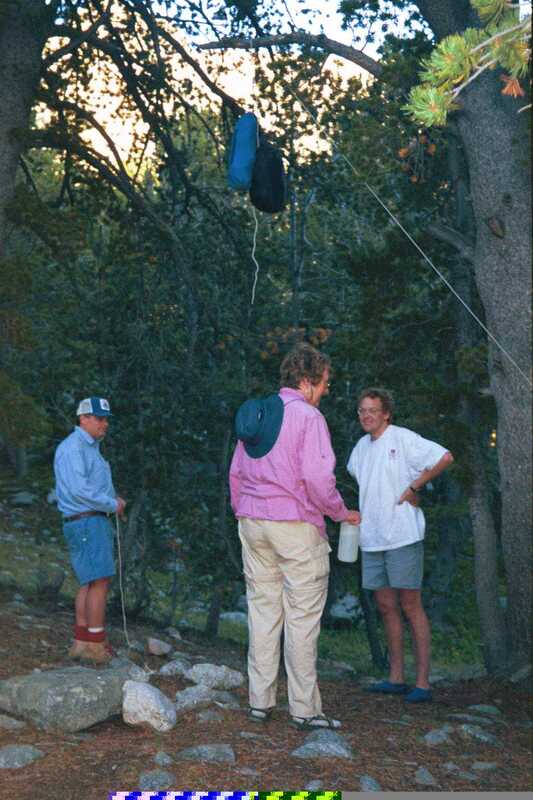 Later, as we prepared to hit the beds, Joel, Peg, and Tom put the food into bags and hung them in a tree to keep food away from the critters. Sunday morning, we got up, ate breakfast, and set off for a hike to Deep Lk and the pass between Temple and East Temple Peaks. 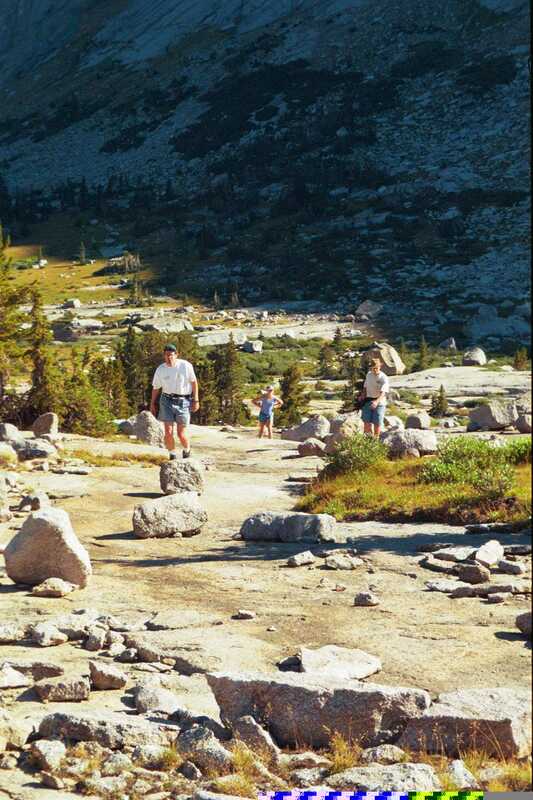 Below, we see some of us making our way up the granite slabs along the creek connecting Deep and Clear Lakes. 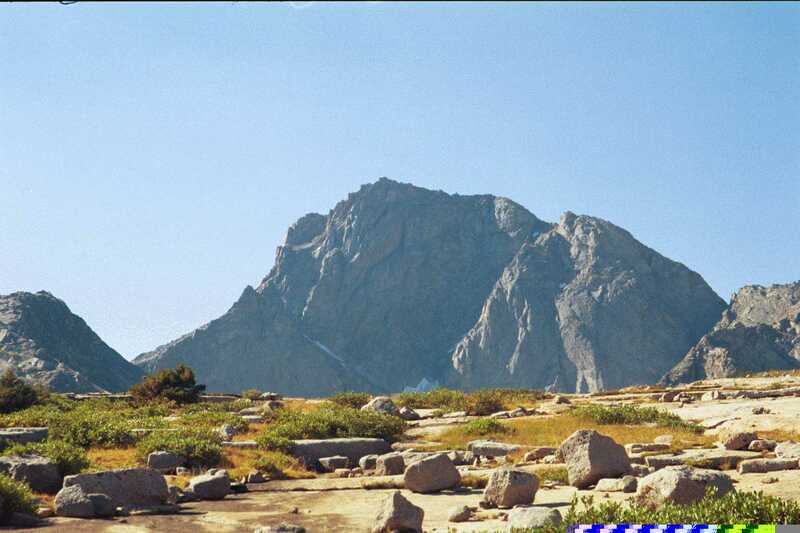 Below is the view of Temple Peak as we approach Deep Lk. 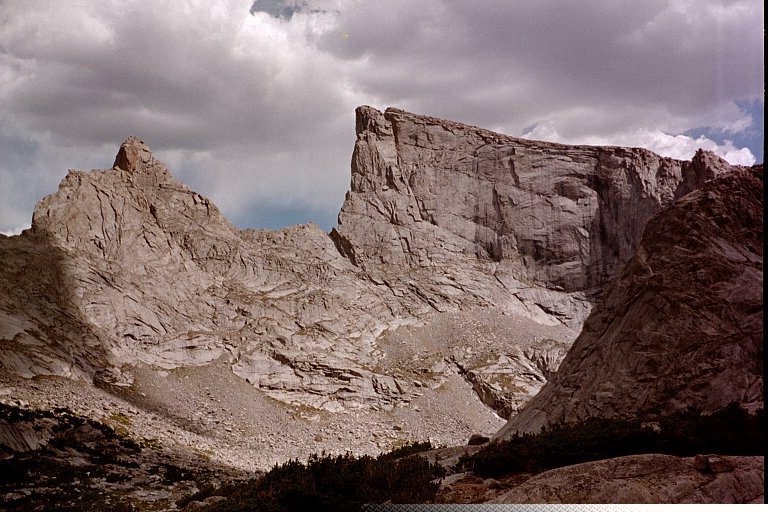 As we arrive at Deep Lk, we get a good view of the sharp flank of East Temple Pk. Hiking to the right of Deep Lk in the photo above, we arrived at Temple Lk (below). Proceeding, we arrive at the pass between Temple Pk (below) and East Temple Pk. 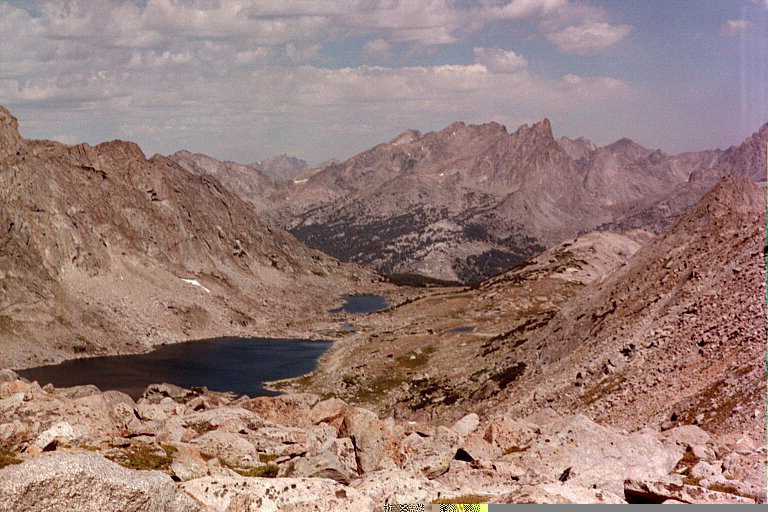 Looking south from the pass, we see more lakes and beautiful mountains. 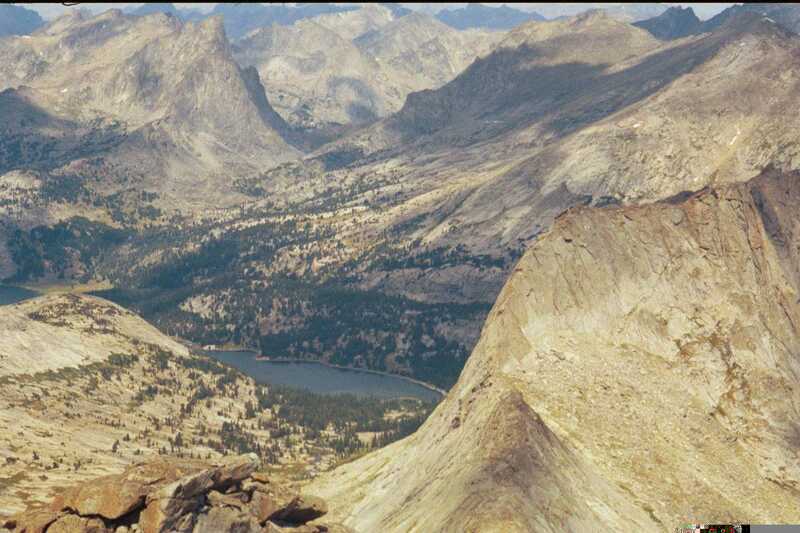 and we reach a point where we look straight down on Haystack Mtn and Clear Lk, our camp (below). We continue on until we reach the sharp point of East Temple Pk. Here the land falls away at nearly 90 degrees. 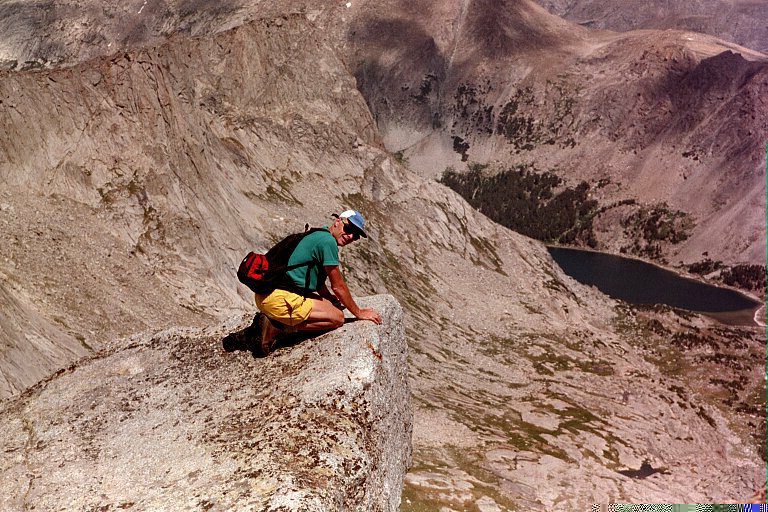 Below, we see Jack looking down at Black Joe Lk with Haystack Mtn on the left. 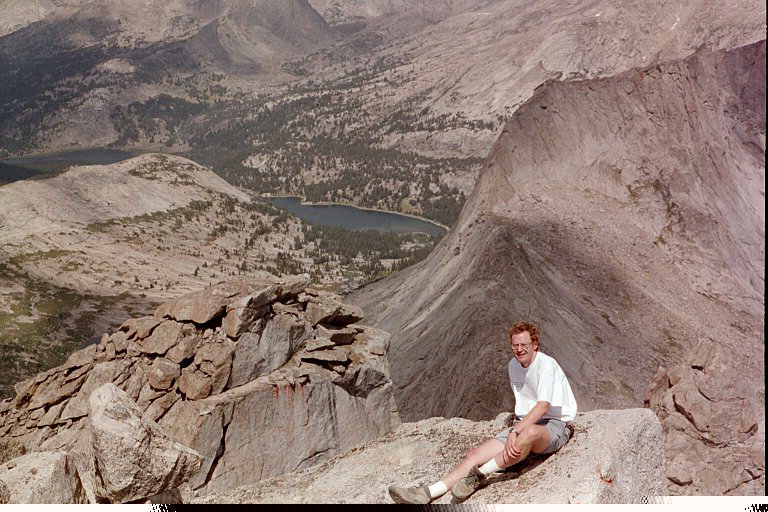 This photo of Tom is also taken from the point of East Temple Pk, with Clear Lk and Haystack Mtn in the background. 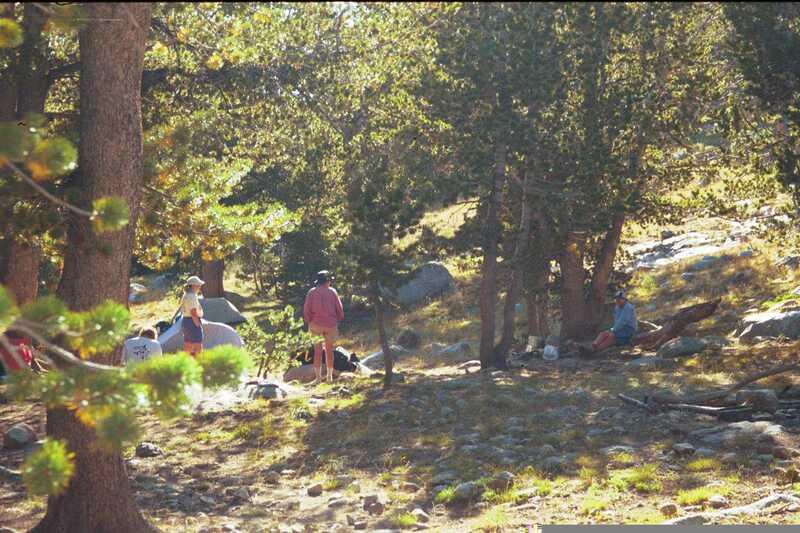 After coming down from the pass, our group pauses for a well deserved break near Temple Lk. 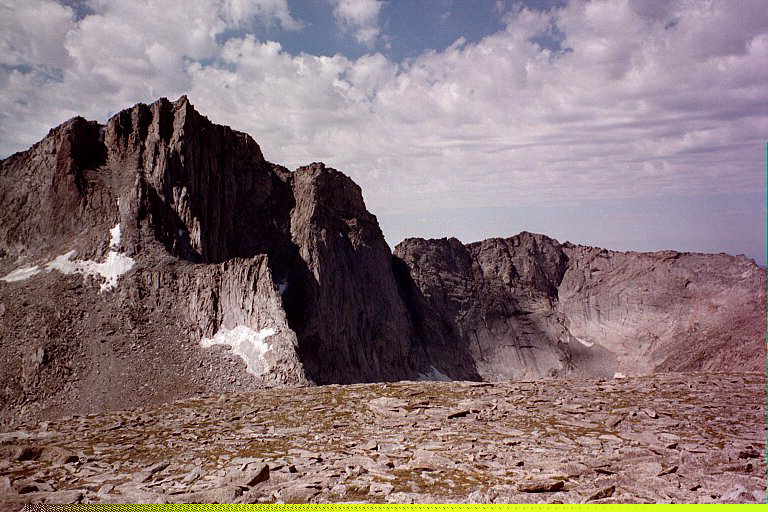 The next morning, we got up, ate breakfast, and set off for a hike to the spectacular Cirque of the Towers. 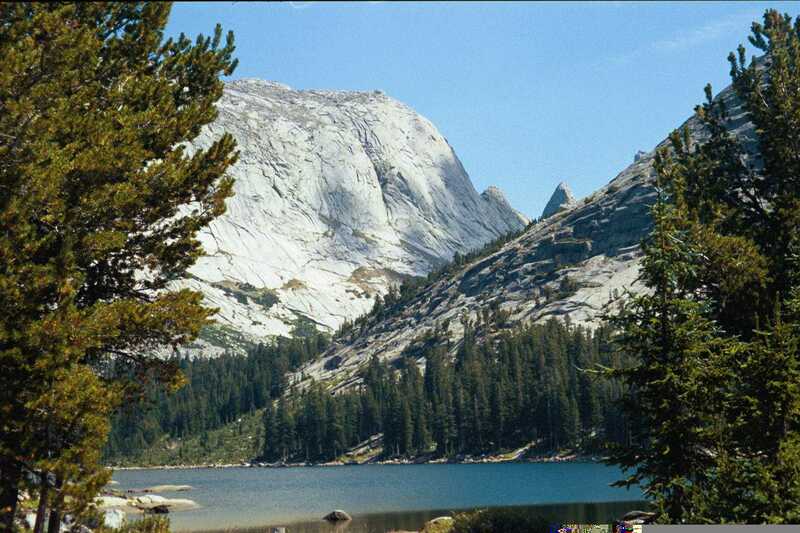 To get there, we drop down from Clear Lk to the meadows near Big Sandy Lk (below). 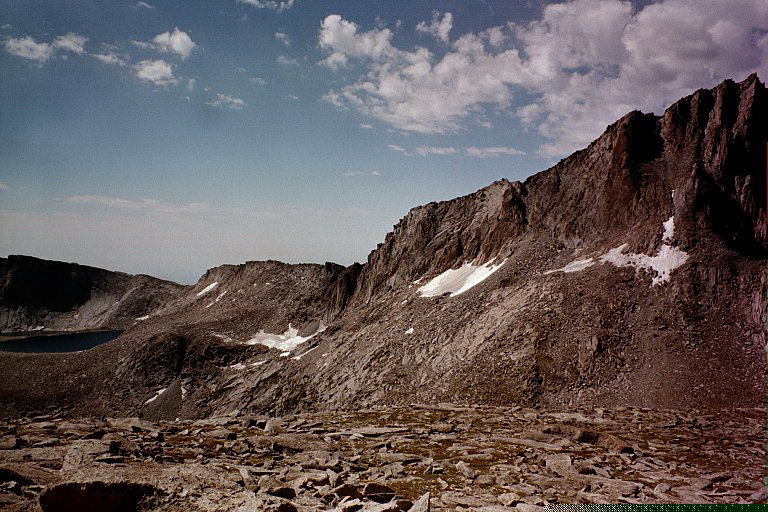 Here, we find the trail junction to Jackass Pass, which leads to the Cirque. To continue this photo tour of our exciting trip, click here.